I have made this scarf or a variation thereof several times. I love Noro yarns. They are almost too luscious to knit with. I have to look at them for a long time before I start to knit. 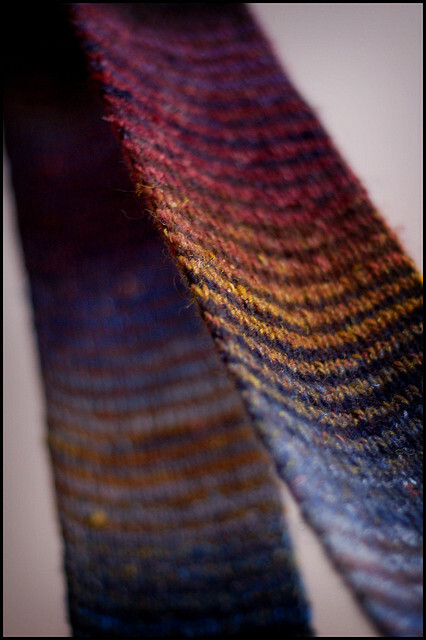 If you are not familiar with Noro, the yarn changes through a variety of colors. The scarf in the picture is knitted with two strands of yarn, switching between the two every two rows. This way you get one strand changing color one way and the other changing in a different direction. Eisaku Noro is the man behind the yarns. Posted on January 12, 2013 by carolnesper. This entry was posted in Artwork, Noro Yarn. Bookmark the permalink.